EMMC DL Tool is a powerful Windows tool that allows you to Flash or Writes Stock Firmware on Qualcomm Devices all smartphones and tablets. 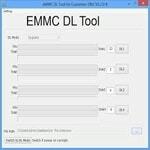 EMMC Dl tool works on all Windows XP, Windows 7, Windows 8, 8.1, Windows Vista and Windows 10. EMMC DL Tool allows you to flash stock firmware on the devices running on Qualcomm Chipsets. If you have a Qualcomm based Android smartphones or tablets, Then you can use this latest tool to flash stock firmware on your smartphone devices. With the help of this latest tool, you can easily choose modes of connection between the device and the computer. if your mobile device is dead or its working is normal then you can easily choose mode switch at any time using options of EMMC DL tool. If you wish to use this latest tool for flash or upgrade your mobile phones and tablets, then simply download this latest tool for your PC windows operating system. Now install this latest Tool on your PC or laptop windows. If your installation process is complete, then open this latest tool and click the EMMC DL Tool button to start the flashing process. This mobile tool also allows you to set up the port number. where your device is attached to the computer. You can quickly set the port using which your device will be connected to the computer. if you know the exact port ID on your computer. where you have attached the device, then you can setup it using this tool features. If you wish to use this latest tool then take a backup of your important data and files from the device, Because after flashing the firmware using the EMMC Tool everything will be deleted. We share simple and easy links for free download. So can you manage it easily, Now just click the given link and your download Qualcomm emmc tool start automatically after a few seconds.